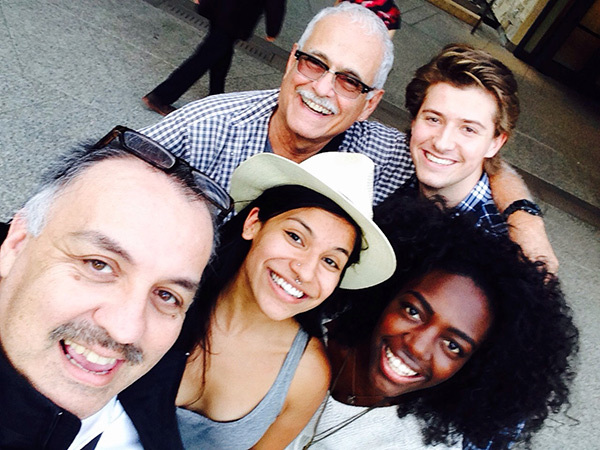 Making a play together: Occidental College grad students with noted Chicano theater scholar Dr. Jorge Huerta at the Getty Villa stakeholder reading of Mojada. I create plays with and about communities I meet around the country. When I am creating a new play, I am also creating the audience that goes with it. 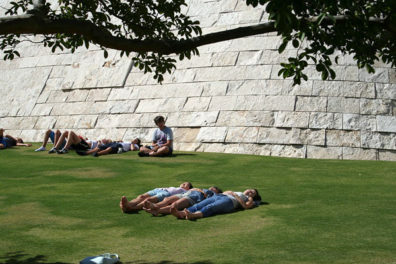 This has been part of my experiment this summer at the Getty Villa. When I travel to regional theaters across the United States, I am telling a tale of an aspect of who we are as a people—but the people telling the tale might not look like the people in the audience. My goal as an artist and citizen is not only to tell an interesting new story, but also to diversify the audience that will receive it. If I tell you a story about a Medea in Los Angeles, especially one that lives in East L.A., I want to make sure that everyone in L.A.—especially the crowd in East L.A.—knows that it is not only being performed in Los Angeles, but that it is also being created here. Our first journey to East Los Angeles was with staff from the Getty Villa and the set designer and director of the play. I took them all in my soccer-mom van, 6ALFARO, and not only did we look at East L.A. architecture, we had dinner at La Parrilla in the heart of Boyle Heights and ended our evening with churros from a truck on Whittier Boulevard. 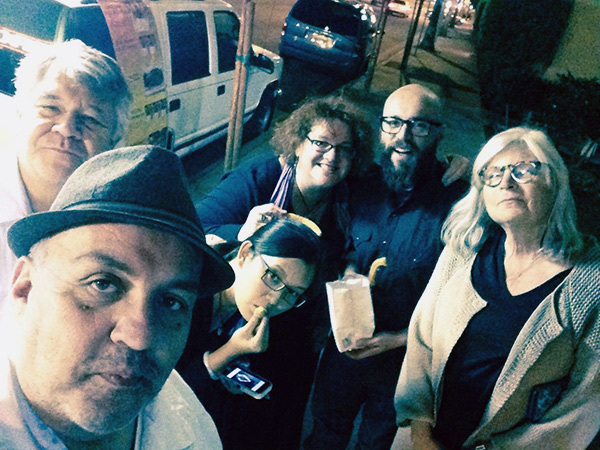 With the Getty Villa gang and the play’s designers on a trip to East L.A., eating churros from a cart on Whittier Blvd. We started our audience experiment with a great early reading of the play in the courtyard at the 70-year-old Los Angeles Music and Arts School, the only arts conservatory in East L.A. We catered delicious Mexican food, and a sold-out crowd of community members, artists, and students came to see a play in the act of becoming. In some ways, a reading like this is the first date. Maybe we might want to see each other again…if you like what you see, of course. We followed this up with what we called “stakeholder” readings, a chance for a more focused and invested community member to not only come hear the play, but to join in a discussion and help in the making of Mojada—and to let their friends know about the play. We also needed to let the community know where the Getty is, so we had a very special evening recently up at the Villa. We rented a bus and brought a mix of community folk, arts leaders, and students to meet the cast that is going to be performing the play in September and to hear what we have done with the play since we last met. Finally, this last week we had a pretty amazing evening, simple and short, with Mary Louise Hart, associate curator of antiquities, speaking to a small but inspired and fascinated crowd at East L.A. Rep, a small non-profit housed in a Parks & Recreation building across from County General Hospital. Mary brought the audience up to speed with the myth of Medea and clued us in on fascinating details about Medea and history; I talked about how I adapted the play; and Vivis, a member of our company, performed a short excerpt. In short, we are growing a project from the ground up. We did some smart things—we hired Jesus Reyes, an artist and community organizer, to help us find the crowd to join us on this journey, and we trusted the community to let us know how we should be moving forward, both in the art and in building the audience. This is the essence of art making, and like the Getty itself, it is a reflection of the city, history and of our possibility as a community. Next stop, a big fat production! 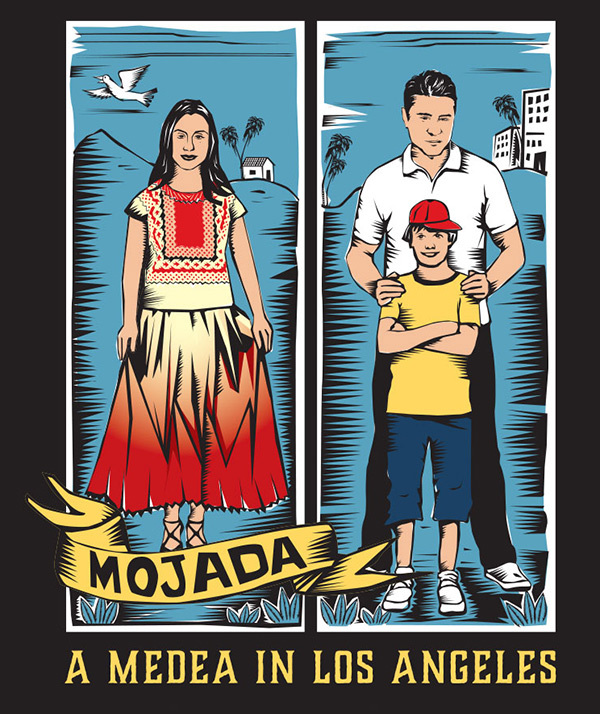 Mojada: A Medea in Los Angeles is a new adaptation by Luis Alfaro based on Euripides’ Medea. 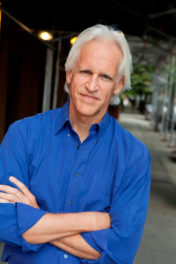 It is directed by Jessica Kubzansky and produced by The Theatre @ Boston Court. 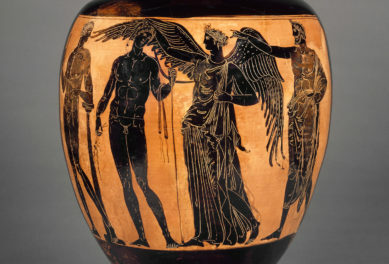 Previews take place September 3–5, 2015; performances run September 10–October 3, Thursdays through Saturdays, in the Getty Villa’s Outdoor Classical Theater. Tickets are available here. Text of this post © Luis Alfaro. All rights reserved. it all sounds like a perfect way to create a theater performance that is relevant and in conversation with the dramatic tradition at its most primal and effective. community catharsis and recreation. viva the oral tradition and all best wishes.